I have been meaning to write this post for ages but things just kept getting in the way. I got hand chemistry in a beauty box I ordered from Latest in Beauty a little while ago and they sure do know how to choose great products to put in the boxes. What it says it does? Directions: Apply evenly to clean hands morning and evening. Expect visible results in 11 days. Intended for use on hands and forearms only. I was excited to put it to the test, as I often get quite dry hands and nothing seems to really do the trick. It says to expect visible results after 11 days, so I wasn't anticipating anything to happen instantly but I was already starting to feel a difference. My hands felt so much smoother, after the first time I put it on and it is different to the other hand creams I have used before. The hand cream really does help to hydrate your hands and my hands haven't felt as good in a really long time! After 11 days, my hands felt fantastic and it was as if they were never even dry in the first place. I know the hand cream is for Intense Youth Complex, but I think it is perfect for anybody with dry/damaged hands and it truly does help to nourish them. 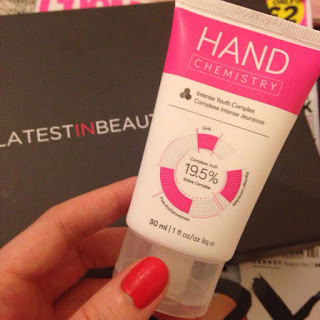 Ageing hands or not, this hand cream is amazing and helps make hands firmer and softer. Would I buy it again? This is one of the best hand creams I have ever tried, it does what it says and it is worth the price you pay. It costs £8 for 30ml and £19 for 100ml, I definitely want to buy more of their products after seeing how good their Intense Youth Complex hand cream is. I'm very impressed by this Hand Chemistry product, if you want soft, smooth, hydrated and firm hands then this is the hand cream for you! It has been named the #1 selling hand cream from October 2013 to October 2014 and it is no surprise, it truly is a great product and I would recommend it everyone.